This article explains in more details how to set up and get started with EventON Variations ans Options addon. Bare in mind the requirements above for this addon to work properly and that the below images are based on current latest version and may differ at the time of viewing. 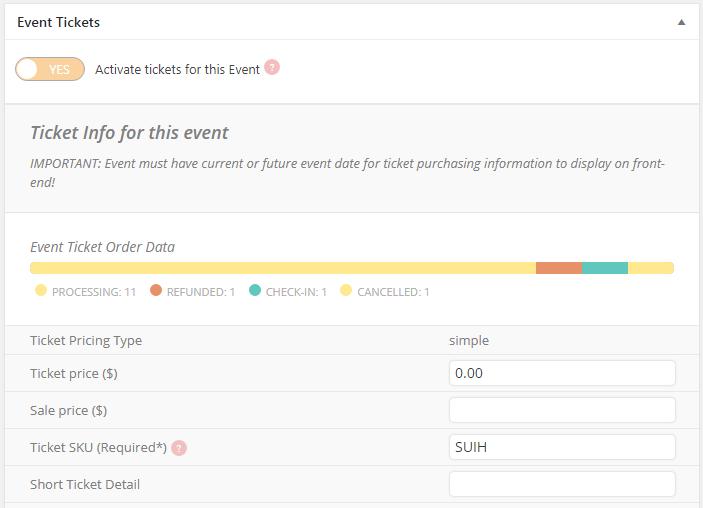 First create event and activate tickets and set default price and SKU and then save changes. 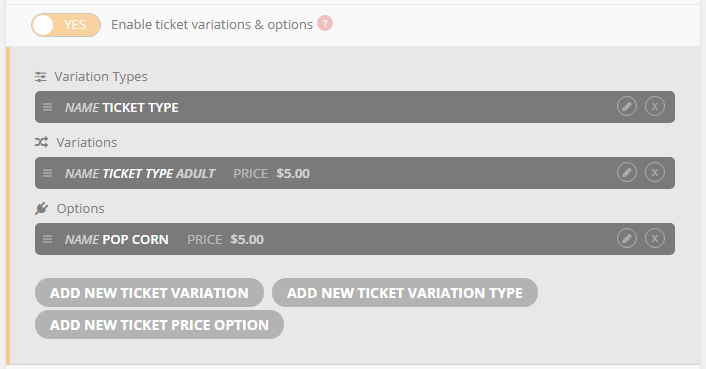 Ticket price options allow you to create ticket price additions eg. Option to add $5.00 for pop-corns at the movie when a customer purchase a ticket. Add new price options form look like below. Stock – you can leave blank for unlimited stock or set a fixed number to limit purchase capacity. Stock Status – defined whether this option is in stock or not. If the stock goes to 0, that will also classify the stock as out of stock. 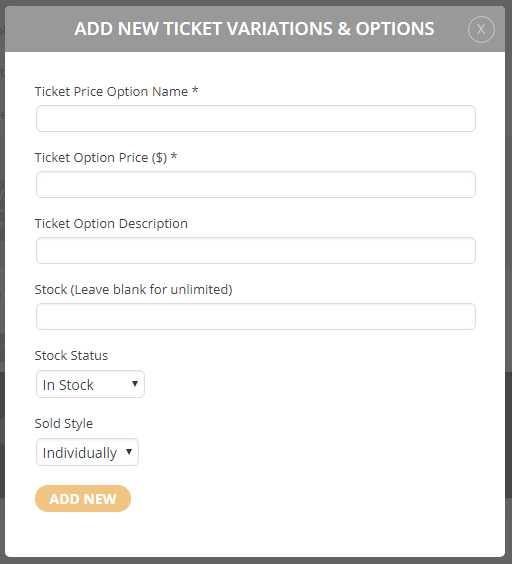 Sold Style – Individually, allow customer to add only one price option per ticket purchase. And Multiples allow customer to add as many per each ticket purchase. Once you add a price option it will show in the event edit page as below. Before adding a variation you must add variation type. 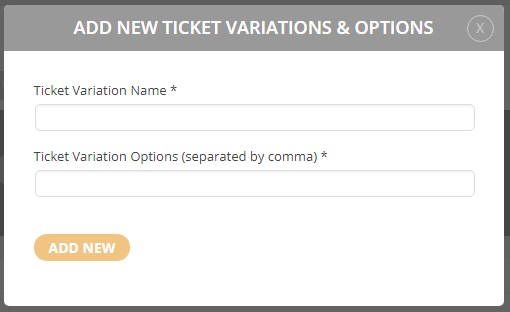 Ticket Variation Options – here you can enter comma separated list of all the variation option values. eg. Adult, Kids as the ticket types. Adding a new variation type will look like below in the event edit page. Variation Type(s) — the ticket type field is already populated from the variation type we set in above example. Similarly all the other variation types you added as variation types will be shown when you go to add a new variation. Ticket Variation Price – here you can set the price for this variation consisting of one or multiple variation types. 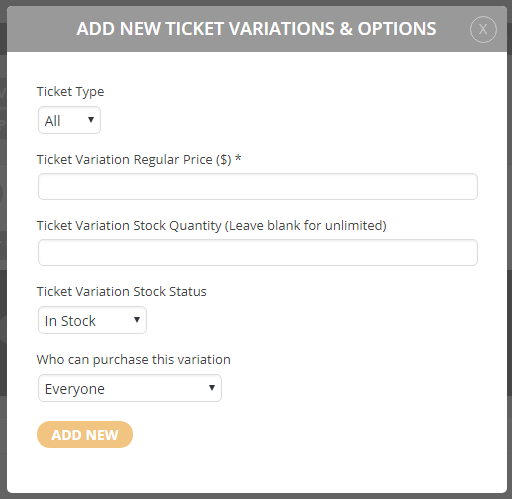 Ticket Variation Stock Quantity – similar to above you can set blank for unlimited stock or set a fixed available quantity for customer to select. Ticket Variation Stock Status – Specify whether this variation is in stock or not. Who can purchase this variation – Be default everyone visiting your site, logged in or not, can purchase variations. And with this option you can set it so a variation can only be purchased by loggedin members. A new variation will look like this in backend. Variations and Options addon is also compatible with our Seats and Booking addons. If you are planning to use variations or options with seats or booking addon, in that case the variations and options must be added within either Seat Map Editor or Booking Manager.